If you're new here, you may want to subscribe to receive our latest blog posts delivered to your email inbox. Thanks for visiting! What’s the “City of Light”? What do you think of when you hear “City of Light”? Did you know the world calls Paris the “City of Light”? Did you know Paris is called that because it was a place of enlightenment in the 18th Century and it was one of the very first cities to use street lights in 1889? (Source: Reference.com) When you think of the word “light”, do you think of the following Oxford Dictionaries definition: “the natural agent that stimulates sight and makes things visible”? I know that is my first thought. So when I think of that definition of light, it doesn’t make sense to me that Paris is called the “City of Light”. It would make more sense to me that Las Vegas, Nevada is the “City of Light”. Why, you ask? Have you seen it all lit up from a plane coming in for the landin g? The lighting “stimulates sight and makes things visible”. It’s something to see! Let’s make a comparison on actual light usage between Paris and Las Vegas. The Eiffel Tower in Paris lights use 22 megawatts per day. That’s around a $3,500 light bill per day! Wow, right?? Okay…. Now Las Vegas has a light bill of around $1.27 million per day and uses up to 8,000 megawatts per day. The MGM Grand Hotel in Las Vegas alone has a light bill of over $3,000 per day according to Luxreview.com! Las Vegas Lights up the Night! Las Vegas “City of Lights”? Las Vegas has been lighting up the desert since the 1930’s. Originally, all the lights were neon, but most have been changed to the more energy efficient LED bulb. In 2010 to 2014, according to Reference.com, Las Vegas slashed the energy demand by 20% by developing energy efficient structures and replacing street lights and traffic lights with the LED bulbs. There are tours in Vegas dedicated to just viewing the lights! You can book several different tours to take while you are in Vegas to get the best experience! Book a tour by helicopter and take a 15-minute, 20-mile loop to view thru Vegas.com. Or you can get tickets to see the Las Vegas Lights Night Tour and view 12 million LED lights within just 5 blocks on the popular Las Vegas strip according to Viator.com. Want a more private viewing? You can book a limo to take in the lights and have your own personal photographer capturing you with the lights in the background! Welcome to Fabulous Las Vegas! Las Vegas could be the “City of Lights”? With all the famous lights, including Times Square in New York that uses 161 megawatts per day, Blackpool Illumination in the UK that uses 15 megawatts per day, and the Eiffel tower using 22 megawatts per day, Las Vegas blows them all out of the water with their up to 8,000 megawatts per day used. (Source: Luxreview.com). The lights are just one reason that people visit Las Vegas. Where else can you see so many lights on so many buildings, signs, and attractions? And why I think that Las Vegas should over take Paris to be called “The City of Lights”, if we’re talking the most popular definition of “light”. Holiday Lights are a big tradition for a lot of people. When I was younger, my dad would go all out on the lights outside. And I loved them…. The sparkle, the brilliance, the joy it brought people! I just didn’t want to be a part of them going up! What a nightmare! I cringe just thinking about the broken glass light bulbs and cut feet and fingers from them, and the “utter joy” of trying to find that ONE burned out bulb that made the entire string go out. (And then hours after trying to make the string of lights all work, finally being able to throw it away and just replace the entire string). My excuses for not wanting to help never held up… I was always coerced into helping with the family tradition of hanging lights. As I’m browsing the holiday string lights, I notice that the one common denominator is that they are all LED. Now, I know that LED has been around awhile, I think? I know nothing about it. That pure white, almost blue color is what I used to first think of when I thought of LED holiday lights. Now, the LED string lights on sale are blue, pink, green, red, orange, purple, yellow, and warm white. So, obviously LED lighting has evolved (into more colors) since it first appeared. Why LED in Holiday Lights?? Honestly, what is LED and how does it benefit holiday lights? Why do I want to buy the LED lights? LED, according to christmas-light-source.com, are Light Emitting Diodes; simple definition: electronic components that produce light. That definition doesn’t really help me, so I wanted to know the benefits of LED holiday lights. According to Wikipedia.org, LED holiday lights have low energy usage, long lifetimes, and low maintenance. You can connect a lot of LED holiday string lights together with one power source since the LED consumes less energy. (engadget.com). LED Holiday Lights Appeared When?? When did LED Holiday lights make an appearance at the holidays? According to christmas-light-source.com, the LED lights were first used in the 1960’s for commercial applications and for 30 to 40 more years after that were improved upon for commercial uses. In 1998 and 1999, LED Christmas lights became a thing and began to adorn the homes and businesses of America. Starting in 2007, the famous New York Rockefeller Center Tree was completely lit up with 100% LED lights. Of course, this isn’t a full list. There are many other LED holiday string lights, including: fairy lights, icicle string lights, rope light, rope light decoration, snowfall string lights, tape light, colored flood lights, net lights, and strip lights. Phew! That’s a lot of holiday light choices and I’m sure I might have missed a few out there! After all my research into the LED holiday lights, I’ve decided that maybe it wouldn’t be as much of a nightmare as it was in my past to hang up all those holiday lights. I won’t be breaking anything since the LED light is plastic and I won’t be replacing a lot of bulbs since they are long lasting. Maybe I should ask my dad if he wants to resurrect the family holiday tradition of putting up holiday lights…. LED lights that is. Feeling Festive? This house was one of the winners on “The Great Christmas Light Fight” show on ABC. It’s that time of year. Halloween is over, and Thanksgiving is almost here but ‘lo and behold, the Christmas items are already out! It seems to get earlier and earlier every year when you start to see those holiday items begging for you to browse them while you are shopping. I’m terrible about decorating but I enjoy the outside lighting and decorations the most. Have you seen the reality show on ABC that started airing the holiday season of 2013 titled “The Great Christmas Light Fight”? Those people take outdoor lighting to the limit! Abc.com says the show is about “Decorating their homes to the extreme for Christmas, families and neighborhoods across America compete to win a cash prize and a coveted Light Fight trophy”. Whether you start getting out your holiday lights right after Halloween or wait until one week before Christmas, make your life a little easier with the WiFi Smart Yard Stake. It’s convenient, easy to use, and it helps save energy! I can’t wait to drive by your yard to see your Christmas light display…. whether it’s to the extreme or not. The Blow Me Up lamp by Ingo Maurer is an innovative LED lighting fixture that arrives rolled up in a can. Who would have thought? Once it is blown up you can lean it against the wall or fastened it to the ceiling or wall with hooks or cords. They are easier to transport than fluorescent bulbs and there’s no danger of falling glass shards if bumped. Also, there’s no drilling required. Yes, it’s that easy. Blow Me Up is a lamp that provides a variety of options. Perfect for those who embrace mobility. There is a integrated sensor switch on one side of the LED strip, which radiates the reflective side of the tube, thus scattering indirect light in the room. So there you have it, an LED lighting fixture that is easy to assemble, is mobile, and easy to clean. The fantastic lighting it provides is great too. Get yours today here. Maximize Your Outdoor Lighting for a Worry Free Vacation! August is the perfect time for a last-minute vacation before the busy school schedules begin. Vacations should be all about relaxing and not having a care in the world. So don’t let the worry about the safety of your home take that away from you. Lighting is an essential part of effective home security systems. Did you know that the most commonly mentioned intruder deterrent is a lack of hiding spots available on well-lit properties? Here are a few ideas to keep your home safe with exterior lighting. Outdoor floodlights are an easy way to light up the dark areas around a home or commercial building. Floodlight fixtures with motion sensors will turn lights on automatically when motion is detected, offering valuable safety and security lighting. The best place to install motion sensor flood lights are on all sides of your home including entryways, corners, decks, porches, driveways, and backyards. Flood lights distribute a wide area of light making them ideal for illuminating large areas and discouraging thieves from targeting your home. Mounting durable outdoor wall lighting fixtures not only provides safety and security around your home or business, but today’s modern exterior lanterns and sconces add curb appeal around your garage, front door or patio. Choose from rustic, traditional and contemporary LED outdoor wall light designs with features like integrated smart technology and energy-saving motion and dusk to dawn sensors. For a consistent look for your home, choose lights that will pair well with your existing outdoor light fixtures. Now you can see who’s at your door from your phone whether you are home, work or relaxing on your vacation. Smart Security Wall Lights offer a security solution built into an outdoor lighting fixture you can access with the touch of your fingers. Many security lights feature a HD camera that detect movement at your door and sends an alert to your smartphone. It’s 2-way speaker and camera allow you to communicate with visitors from anywhere using an app on your phone. If it is an unwanted visitor simply sound the built-in alarm to scare them off. On covered porches, recessed lighting can be installed to provide direct overhead lighting, illuminating areas for excellent crime deterrent. As one of the most versatile sources of light for both residential and commercial buildings, outdoor recessed lighting fixtures, offer a layer of general lighting that seamlessly blends into any space. There many options of trims and housings, so you can customize the perfect lighting for your space. Why pay an energy bill for your outdoor lighting when free energy shines down on your yard all day long? Path and post lights can be installed along your walkways and come in a variety of styles and finishes. Many have motion activated options that include a built-in photocell to ensure that the LEDs are only activated at night. So many options to keep your family and visitor’s safe. So let’s get started on your outdoor DIY lighting projects so you can enjoy your vacation with peace of mind. One of the most commonly mentioned deterrents is a lack of hiding spots available on well-lit properties. Security lights are quick and easy to install and are proven to be a highly effective crime deterrent. You certainly earned your vacation, so enjoy your time away, worry-free. This month marks 18 years of Pegasus Lighting offering unique lighting products online, and we’re celebrating this major milestone in a big way. 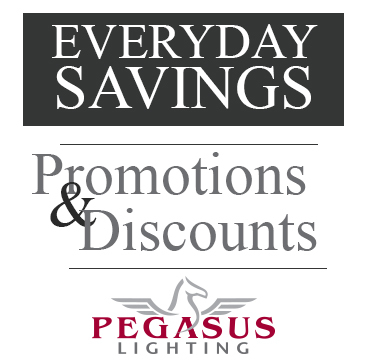 Use promo code PEGASUS18 to receive $18 off your PegasusLighting.com order of $100 or more (+ Free Shipping!). Ends 5/31. Upgrade your home to energy-efficient LED light bulbs. Install under cabinet task lighting in the kitchen. Gift your favorite graduate with a frame-mounted diploma light.